Symfony is an open source framework for developing dynamic PHP web applications. This tutorial walks you through the process of generating a Symfony application and deploying it to an AWS Elastic Beanstalk environment. 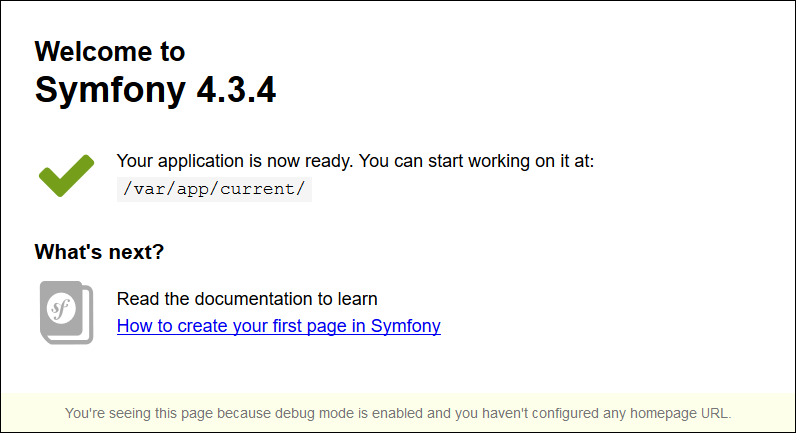 Symfony 3 requires PHP 5.5.9 or later and the intl extension for PHP. In this tutorial we use PHP 7.0 and the corresponding Elastic Beanstalk platform version. Install PHP and Composer by following the instructions at Setting Up your PHP Development Environment. Use the AWS Management Console to create an Elastic Beanstalk environment. Choose the PHP platform and accept the default settings and sample code. Composer installs Symfony and its dependencies, and generates a default project. Create a source bundle containing the files created by Composer. The following command creates a source bundle named symfony-default.zip. It excludes files in the vendor folder, which take up a lot of space and are not necessary for deploying your application to Elastic Beanstalk. eb-symfony$ zip ../symfony-default.zip -r * .[^. ]* -x "vendor/*"
Upload the source bundle to Elastic Beanstalk to deploy Symfony to your environment. To optimize the source bundle further, initialize a Git repository and use the git archive command to create the source bundle. The default Symfony project includes a .gitignore file that tells Git to exclude the vendor folder and other files that are not required for deployment. What's this? By default, Elastic Beanstalk serves the root of your project at the root path of the web site. In this case, though, the default page (app.php) is one level down in the web folder. You can verify this by adding /web to the URL. For example, http://symfony.us-east-2.elasticbeanstalk.com/web. To serve the Symfony application at the root path, use the Elastic Beanstalk console to configure the document root for the web site. For Document root, type /web. When the update is complete, click the URL to reopen your site in the browser. For more information about Symfony, see What is Symfony? at symfony.com. In this tutorial, you used the Elastic Beanstalk console to configure composer options. To make this configuration part of your application source, you can use a configuration file like the following. For more information, see Advanced Environment Customization with Configuration Files (.ebextensions). Symfony uses its own configuration files to configure database connections. For instructions on connecting to a database with Symfony, see Connecting to a Database with Symfony.